"Gotham Fish Tales" is the story of recreational and commercial fishing within New York City. Engaging characters show a remarkably resilient fishery. It's an inspiring tale because it flies against the conventional wisdom of what coexists in the largest American city - a highly utilized marine ecosystem hard pressed against the density of the city which supports a vibrant and varied fishery, second to none by any angler's standard. All kinds of fish species, from sharks to tuna to tropical fish, pass through local waters. Stalwart fisherman, scientists, environmentalists, historians, community organizers and government enforcers all contribute to this story. This remarkable story is told through characters whose knowledge, humor and at times pathos make them people we care about and remember. Robert Maass, born and based in New York City, has been working as an editorial still photographer for over 20 years. He has been widely published in domestic and international publications. For ten years he was a Contributing Photographer for Newsweek magazine. His editorial experience has taken him around the world covering feature and major news events, from the collapse of the Soviet bloc to American presidential campaigns. He has also worked extensively for various non-governmental organizations. Since the late 1980s Maass has written and photographed ten books for children. 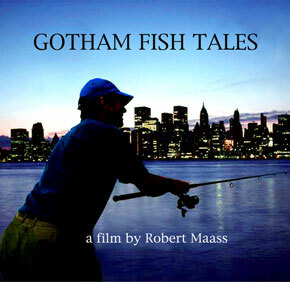 Gotham Fish Tales is his first feature length documentary. Rob lives with is wife Hillary and children Lucas and Lily in Brooklyn, New York.